Roll over Ken Colyer; take it away Shaye Cohn! So the woman playing forthright piano on this youtube clip – https://www.youtube.com/watch?v=v9l6n1B8ISc&list=PLRHNuO2g3rUd2nXtjc4BtyOeQ7vy1Ozx5&index=2 – is Shaye Cohn, the granddaughter of saxophonist Al Cohn. If your computer is like mine, it will lead to a medley of clips. Follow it through. The woman playing old-time fiddle on the next clip is Shaye Cohn. Stick with it. The woman playing the lovely Bunk Johnson-style cornet on the next clip is Shaye Cohn. The next clip is a blurry US roots femme waltz thing. That's Shaye doing such nice bow work on a string bass. I've been trying to find the clip aired last night at Manchester Jazz Society of a group of street musicians in New Orleans, featuring Shaye on cornet and piano. It was classic New Orleans... Reminded me of the time I was there. Social music-making seems to be her thing. The next clip isn't it, but close. Playing piano on the street at night with some old-timer on clarinet. You get the idea. 'Make Me A Pallet on Your Floor'. What's Shaye doing? Duetting on cornet with a trombone. What a soulful singer, and dig: a rising generation is getting into New Orleans traditional jazz, with Shaye as some kind of omnipresent Zelig-like figure. Anyway, I just thought I'd share my discovery of the day with you. A Short Ride on the Arrow of Time comes in two formats, CD and vinyl. Whilst ‘First Ride on the Continuum’ is common to both, ‘Third Ride on the Continuum’ is exclusive to the vinyl, and ‘Second Ride on the Continuum’ and ‘Fourth Ride on the Continuum’ are exclusive to the CD. 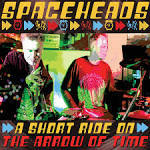 After the appetisers of the last Spaceheads releases - two EPs – this feels like a feast. And, with the CD clocking in at over an hour, with an additional and equally essential twenty minutes on the vinyl, that ‘Short’ in the title might be perceived as a misnomer. Two things to note here: a glance at the titles indicates that Spaceheads have swallowed a book on popular physics, with quarks, entropy, Schrodinger, kaons and pulsars abounding. What Spaceheads are dealing with here is deep time, of which an hour and twenty minutes is an infinitesimal blip. This in contrast, and an antidote to, the everyday experience of shrinking time. Time never drags on A Short Ride. This is because (on one side of the duo), Andy Diagram on trumpet, live looping and electronics, ensures that the sonic adventure is rich in incident. Just when you think you have his exotic multiphonic trickery pegged, he comes up with something that surprises or/and a melody that delights. And (on the other side) Richard Harrison’s drums are constantly rolling, broiling, inciting and only ever a hair’s breadth from out-and-out Burundi beat. In other words, Spaceheads precipitate a very rare and enviable condition: the wide-awake trance. Miraculously, this richly detailed palimpsest was improvised live in the studio with no preparation and no roadmap. This is especially amazing, as the whole is crammed with hooks, beauty and breaks enough to fill the record shop at the end of the universe. Of course, I realise that 'opposites attract' is rudimentary stuff besides the quantum science that provides the inspiration here. The floating stuff is either mesmerising – try ‘Celestial Timepiece’ from ‘Second Ride’ – or a pristine state to be subverted at whim, as when ‘Carry on crazy coan’ segues into ‘Running out of time” (‘Third Ride’), where diamond-hard beats propel a dream Bacharach and David melody which proceeds to fracture into urgent stabs. Rhythm is the thing, and rhythm provides a portal to a whole parallel universe of pop culture, suggested by the music. These are doubtless accidental and subjective, but I glimpsed Dobie Gray in with the in-crowd, and Joe Strummer lost in the supermarket (possibly one and the same in the topsy-turvy world of advanced physics). And so it goes: the Spaceheads yin and yang and push and pull all along the strange celestial road to reach some kind of apotheosis in ‘An Air of Gentle Gravity’ (Fourth Ride), which is music of the highest order, spontaneous or no. There’s fun and playfulness too: munchkin voices unexpectedly appear in ‘Flip to the Future’. In fact, the chief bafflement about A Short Ride is the complete absence of dark matter or negative energy. Those physicists might need to re-write the rules (again): there’s a new paradigm and it’s name is Spacehead.